Leopard seals have a sinuous body and massive head and jaws. Because of the shape of the head, they appear almost reptilian. Females grow slightly longer and heavier, but not so much larger that the sexes can be distinguished in the field based on size. The long body usually appears slender, and is thickest through the shoulders and upper chest. There is no trace of a forehead. The head is widest at the eyes, which appear small and set both far apart and well back from the end of the broad U-shaped muzzle. The nostrils are situated on top and just back from the end of the muzzle. The lower jaw is massive, being long, wide, and thick, as are the throat and neck. Leopard seals have an enormous gape, and the teeth, especially the canines, are conspicuously large when seen during yawns and other open-mouth displays. The vibrissae are clear to pale, generally quite short and inconspicuous. The fore flippers are long, wide, and somewhat sickle-shaped tapering to a rounded end, and are similar to those of otariids, but are fully furred. The first phalanx is long and wide, creating a thick strong leading edge to the flipper. Leopard seals can spread the digits of the fore flippers while swimming and stretching, greatly enlarging the surface area. 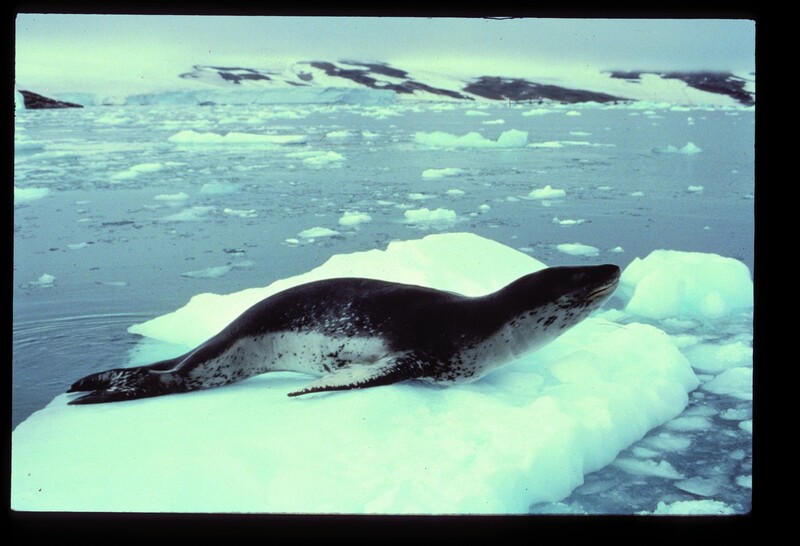 The fore flippers are situated farther back on the body from the muzzle than on other Antarctic phocids, due to the proportionately longer neck of the leopard seal. Leopard seals have a countershaded color pattern. They are dark gray above and light silvery gray below, the shades meeting and blending high on the sides of the torso and neck, where the light ventral coloration rises to just below the level of the eye. A swath of lighter color from the neck extends forward on the upper jaw above the mouth to the end of the muzzle, which highlights the line of the mouth. Leopard seals are spotted to varying degrees, most noticeably on the sides and belly. Pups have essentially the same markings in the same proportions as adults, although their coat is softer, longer, and thicker. Dense constellations of spots may occur without any pattern or symmetry. One area where dense clusters of spots normally occur is around the insertions of the fore flippers. Adult males are 2.8 to 3.3 m long and weigh up to 300 kg. Adult females are 2.9 to 3.6 m, with very large animals possibly reaching 3.8 m, and weigh 260 to upwards of 500 kg. Pups are 1 to1.6 m in length and weigh 30 to 35 kg at birth. The dental formula is I 2/2, C 1/1, PC 5/5. The canine teeth are very long (up to 2.5 cm) and sharply pointed. The post-canine teeth are ornate with several large lobes, and resemble those of crabeater seals. Seen well, the distinguishing features of the leopard seal: large head and muzzle, long fore flippers, long thin body, irregular spotting pattern, and usually strong countershaded coloration, are unmistakable. At a distance, however, they might be confused with crabeater, Weddell and Ross seals. Both Weddell and Ross seals have much smaller heads, and very small blunt muzzles, with proportionately shorter fore flippers that are situated farther forward on the body than on the leopard seal. Of these, the crabeater is the most likely candidate for confusion. Crabeater seals are shorter overall, with a proportionately smaller head and shorter muzzle that is demarcated by a small angular forehead. Crabeater seals are generally lighter in color, with minimal or no countershading. Also, they frequently have long scars, and usually have small numbers of spots concentrated on the shoulders, flanks, tops of the fore flippers, and around the insertions of the flippers. Leopard seals are widely-distributed in Antarctic and Subantarctic waters of the Southern Hemisphere, from the coast of the continent north throughout the pack ice and at most Subantarctic islands. Vagrants regularly reach warm temperate latitudes. They haul-out on ice and land, often preferring ice floes near shore, when available. Pups are born on the ice from early November to late December and the period may be as long as early October to early January. Births at South Georgia occur from late August to the middle of September. Pups are probably weaned at four weeks old, and female estrous occurs at or shortly after weaning. Unlike crabeater seals, male leopard seals do not haul-out with female-pup pairs. Mating is believed to occur in the water. At sea and on the ice, leopard seals tend to be solitary. They float at the surface, and crane their neck high to view objects of interest in the air and will hide around ice floes while underwater, and searching for and stalking prey. Leopard seals can submerge by sinking, which is typical of most phocids (which use their hind flippers for propulsion), or by rolling forward, the more typical method of otariids (which use their fore flippers for propulsion). Leopard swimmers are fast, powerful, agile swimmers. Swimming is most often accomplished with long, powerful, coordinated sweeps of the fore flippers, rather than the side-to-side strokes of the hind flippers typical of most phocids. Leopard seals mostly sleep or are otherwise inactive when out of the water, but will move in a serpentine slithering manner across ice, and toboggan like penguins. They are curious and unafraid of humans and small boats and will approach, and occasionally brush against, and even mouth small boats. Explorers and scientists from the heroic age of exploration to present occasionally report being stalked by leopard seals swimming along the ice edge or leads, where people are working and walking. Leopard seals have lunged at ankles and, rarely, briefly grabbed people. They will closely approach human divers and appear to be very curious during these encounters. Despite being a top predator, leopard seals themselves are prey for killer whales. Leopard seals are probably best known for their habits of preying upon penguins. The diet is actually quite varied and changes with seasonal and local abundance of prey. Leopard seals will consume krill, fish, squid, penguins, a variety of other types of seabirds, and young seals, including phocids, such as young crabeater and southern elephant seals and otariids, such as young fur seals. They will also occasionally scavenge from carcasses of whales. Most prey is caught in the water. Penguins are regularly held in the teeth by one end and slung in an arc with a rapid snap of the head and neck to be smashed, and torn open at the surface. Smaller pieces are then swallowed. The loud crack produced when a leopard seal slaps a penguin on the surface has been reported to be audible in air for more than a kilometer. Young, newly fledged naïve penguins are most vulnerable, but adult birds are taken as well. Leopard seals patrol and regularly station themselves just off penguin rookeries and wait to ambush and chase penguins transiting to and from these colonies. The leopard seal is not listed as endangered or threatened. The population is estimated to be 220,000 to 400,000, with highest densities occurring in pack ice with large bash ice blocks and cake ice floes that are 2 to 20 meters in diameter. Leopard seals are protected by the Antarctic Treaty and the Convention for the Conservation of Antarctic Seals. There are currently no threats from human activity throughout most of the species’ normal range. The effect of global climate change on the formation and extent of Antarctic pack ice, and leopard seal prey, poses an unknown threat to this ice-dependent species. Boveng, P.L., L.M. Hiruki, M.K. Schwartz and J.L. Bengtson. 1998. Population growth of Antarctic fur seals: limitation by a top predator, the leopard seal? Ecology 79(8):2863-2877. Hiruki, L.M., M.K. Schwartz and P.L. Boveng. 1999. Hunting and social behavior of leopard seals (Hydrurga leptonyx) at Seal Island, South Shetland Islands, Antarctica. Journal of Zoology, London 249:97-109. Kooyman, G.L. 1981. Leopard seal-Hydrurga leptonyx Blainville, 1820. pp. 261-274 in S.H. Ridgway and R. Harrison (eds. ), Handbook of marine mammals, Vol. 2: Seals. Academic Press. Rogers, T.L. and M.M. Bryden. 1997. Density and haul-out behavior of leopard seals (Hydrurga leptonyx) in Prydz Bay, Antarctica. Marine Mammal Science 13(2):293-302. Rogers, T.L. 2002. Leopard seal Hydrurga leptonyx. pp. 692-693 in W.F. Perrin, B. Würsig and J.G.M. Thiewissen (eds. ), Encyclopedia of marine mammals. Academic Press.